People who know me are well aware of my paranormal fixation. When I travel home to Indiana to visit my friends and family, there is always a ghost hunt set up and waiting for my arrival. This time was no different. The interesting part was the location. I’ve investigated at some strange places, but this was one of the most unusual locations I’ve been invited to. It was an Eagles Lodge. It’s not your typical haunted house. It’s not a gothic Victorian or an abandoned asylum; it’s a happy place where people gather to socialize. They sit at the bar and chat with Rita, the bartender. They come for the live music on the weekends and the poker games on Thursday nights. Apparently, death doesn’t stop some of them from returning. I was invited to investigate the lodge by Rita. Having tended bar there for many years, she’s often in the building late at night after everyone else has gone home. Over the years, she’s experienced some very unsettling events. She hears the door open and close, despite the fact that no one is there. As she tidies up the bar, she hears footsteps walking across the large floating dance floor. Once, she even saw a misty form materialize in front of her. We started the investigation at ten o’clock in the evening, after the bar had closed for the night. I took a tour of the entire building, learning some of the history and getting a feel for the space. Most of the rooms were fine, but I could feel spirit energy in several spaces. It felt light and friendly, not something that would be threatening to anyone. I was comfortable inviting Rita and several of my friends and family to join me in the investigation, including my mother and youngest sister. I started off with a simple EVP session. We’ve learned that spirits can’t always communicate with us verbally, but we can sometimes catch their voices when we record the session with a digital voice recorder. We ask simple questions, leaving fifteen to twenty seconds afterwards for a response. Sometimes they talk to us, sometimes they don’t. After several minutes of this, I introduced my K2 meter, which also measures the EMF fields. Right off the bat we started getting responses. When we asked if someone was with us, the lights flashed. 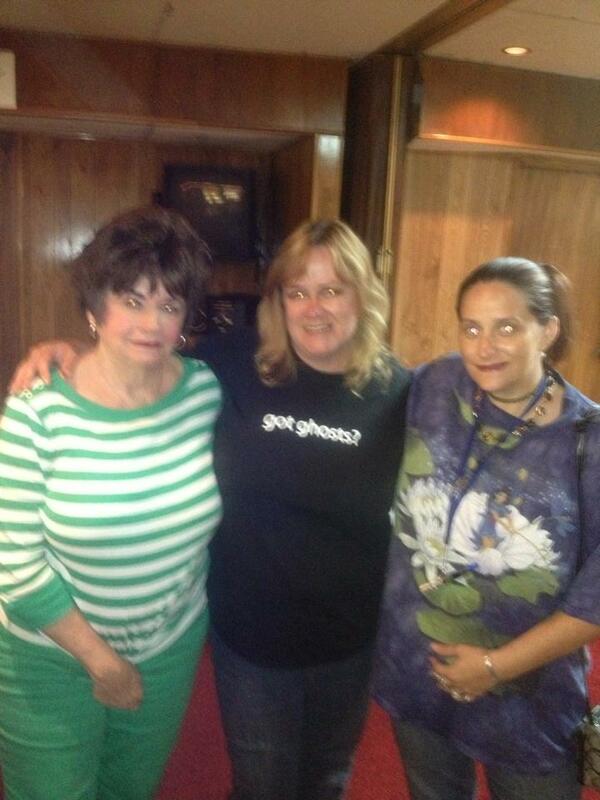 We asked if the spirit was a female and the lights flashed again. Through a series of questions, we learned that she liked to watch the people dance on Friday nights. Later, I brought out my favorite piece of equipment: the P-SB7 Spirit Box. It scans the radio stations at a rapid rate, allowing the spirits to talk through the white noise. There is some controversy with this piece of equipment. Some people feel that the voices they’re hearing are stray radio signals or HAM radio responses. Others, like me, know differently. We began getting names right away. I won’t mention them here, for the sake of privacy, but they were very relevant. They were the names of patrons who’d once spent time at the lodge. One of them was a man who played poker there every Thursday night, another was a former bartender. As the night continued, Rita became more and more excited by our findings. She was able to talk to her old friends. We ended the investigation near two o’clock in the morning. As we parted in the parking lot, Rita gave me a big hug. The haunting went from scary to bittersweet in the span of several hours. Rita was no longer afraid to be in the building by herself. She actually looked forward to having another chance to talk to her old friends again. For me, that’s what it’s all about. It’s not about poking spirits to get them to respond to us, it’s about uncovering the truth behind a haunting. Sometimes it’s not as scary as you think it is. This entry was posted in Night Thoughts, Paranormal, Uncategorized and tagged Eagles Lodge, ghost hunting, Paranormal, vacation by jonimayhan. Bookmark the permalink.